This season features traditional sewing in all its forms with a special emphasis on quilting. Get ready to redefine the word “traditional” as we integrate some common quilting principles into fashion sewing with fantastic results! Today’s show takes a look at quilting in a whole new way, as common quilt techniques find their way into fashion. Quilting is not just for on your bed – Angela Wolf introduces the practice of quilting the lining to your garment - just like the couture designers, without batting. Then it’s a turn to traditional quilting with an easy paper piecing technique from Rebecca Kemp Brent. Bigger is not always better! Start out with a manageable project when you want to learn a new technique. Joanne Banko appears first with a simple quilted tote. Learn the basics of an easy quilt square, and then use the technique to create a basic tote. Next, Paula Reid shares tips for working on a large project such as a bed quilt – just how do you work with all of that fabric on your machine? Last is Angela Wolf with techniques for quilting leather and fleece for warmth and style. Garments get a makeover on today’s show. You can make the same pattern over and over again but it will look totally different depending on your fabric and color choice and other surface embellishments. Angela Wolf begins with a beautiful and traditional sheath dress. An intricate appliqué trim completely changes this basic silhouette. Then, embroidery expert Eileen Roche demonstrates simple monogram techniques for all different garments – it’s a traditional look updated with a contemporary approach. Just because a technique is traditional doesn’t mean that the item you create can’t be on trend for today’s fashion. Successful sewing is all about learning the basics and then using those ideas to create garments that fit your personal style. On this show we incorporate basic sewing and serger techniques for knits into a trendy bandage skirt with Rachel Howard. Then, Marie Zinno demonstrates trendy boot socks that will instantly personalize your outfit. Finally, Angela Wolf has a tip on using your serger for an elastic waist. Show off your embroidery skills with great totes and jeans. One of the best parts about sewing is the chance to show off some of your latest creations. On this show guest experts give you lots of opportunities to be proud of your embroidery skills. First, Angela Wolf creates an embroidered tote with an amazing kaleidoscope design. Then, Eileen Roche has her own quilted clutch with embroidery. Last, Angela returns with a restyle of your favorite pattern or readymade jeans with embroidery embellishments. On this show, piecework like you’ve never seen it before – as traditional quilting meets fashion. Think a little outside of the box as Angela Wolf makes a color block dress that’s really just a variation on a large patchwork design. Then, quilter Jeni Baker demonstrates piecework on a smaller scale with a half square quilt perfect for beginners. We apply quilting concepts to all sorts of different finished projects from pillows to skirts on this show. If you’re a fashion sewer, quilting is a little break from fitting and if you’re a quilter we have garments that incorporate your techniques in garments. First, Paula Reid shares her creative method for doing trapunto. Then, Jeni Baker has an easy but modern feeling quilt project – this time it’s the log cabin as coasters. Finally, Angela Wolf takes a quilt technique for seaming and uses it on a patchwork style skirt. Simple finished items are the base for today’s projects. Our experts give them some added pizzazz. Eileen Roche starts out with a simple tee shirt – add some embroidery and it begins an amazing infinity scarf. Then, Joanne Banko has the secrets for embellishing a plain sheer wrap and turning it into a fabulous accent. Get started with the basics for traditional quilting. What could be more basic than quilting for home decor and apparel? Rebecca Kemp Brent has a demonstration on free motion and guided quilting to hold a kaleidoscope appliqué in place, plus a short discussion on fusibles and needles. Then, Angela Wolf demonstrates ruching with elastic thread. In sewing it’s embellishments that are the extra step that takes us from ordinary to extraordinary. Angela Wolf is known for beautifully fitted jackets. On this show she adds trim to take them over the top with style. Then, Marie Zinno shares a way to make simple work out clothing into stylish day wear all with embroidery. Finally, the perfect accent is a couture detail. Janet Pray demonstrates mistake proof bound button holes. Our recurring theme is “let the experts show you how”. What experts offer is that little something extra – maybe it’s a tip, or an extra step, or maybe even a shortcut – but they have that technique perfected over countless projects and want to share with you! Janet Pray is our first expert with a wonderful technique for single and double miters the professional way. Then look at patchwork just a little bit differently with a biscornu – a type of pillow design demonstrated by Rebecca Kemp Brent. Finally, Angela Wolf creates a sheer fabric scarf using free motion stitching and stabilizer. 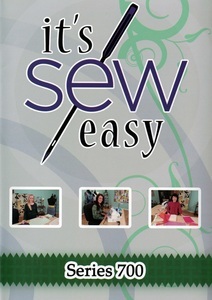 There are many sources for inspiration when choosing a sewing project. Sometimes we find the perfect pattern or silhouette, and sometimes it’s a special occasion we want to sew for, other times we simply love a particular fabric and look for something to make out of a gorgeous cut. But each fabric has characteristics that require different techniques. We chose 3 fabrics today and projects that are unique to the fabric chosen. First, Angela shows her technique for needle felting on silk. Next, Tina Givens introduces us to one of her favorite fabrics – linen. She has some tips for quilt blocks that tell a unique story. Then, Angela returns for free motion techniques on cotton. There are many different ways to manipulate fabric for a textural look and feel. Especially in a monochromatic color scheme texture really stands out. Rebecca Kemp Brent starts out with a tucked bolster pillow – it’s a traditional technique and look that complements many different décor styles. Then, it’s a traditional quilting technique in a nontraditional way as Angela Wolf uses a walking foot to quilt a jacket. We finish up with flat felled seams - common in quilting but incorporated into clothing with Janet Pray.